Airborne warning and control system (AWACS) aircraft do not engage in direct combat, but are vital force multipliers for advanced militaries. An AWACS, such as the U.S. and NATO E-3 Sentry and Russian Beriev A-50/NATO: A-50 MAINSTAY carry a large air search radar and a battle management staff that directs the operation the actual combat aircraft, as well as participating in an integrated air defense system. Since the older aircraft are physically aging, variations of the electronics go into newer aircraft, large wide-bodies such as the Japanese AWACS in a Boeing 767, medium-sized airliners such as the Boeing-built Wedgetail 737 used by Turkey and other countries, and some business jets, the latter especially for Israeli Phalcon electronics. There is a proposal to make the U.S. developed E-3 and the Soviet-developed A-50 have interoperable communications, so they could work together in coalition operations.. Some smaller airborne early warning (AEW) aircraft, such as the carrier-capable E-2 Hawkeye, have a limited staff, and expect to exchange data, over encrypted, low probability of intercept radio links, with the overall air warfare commander on a ship or at a land base. The Hawkeye is used by several countries, including Egypt, France and Israel, Singapore and Taiwan, and does have a limited control capability with a few seats for air controllers, as opposed to AEW helicopters that simply lift the radar but do not examine its output except for troubleshooting. Many analysts have suggested that the British came close to losing the Falklands War for the lack of airborne early warning. Since then, they have developed a helicopter-based AEW systems, the Sea King ASaC7. Other navies, who do not have the carriers to launch fixed-wing AEW aircraft, have helicopter versions, such as the the Italian Agusta Westland EH101, and the Russian Ka-31. 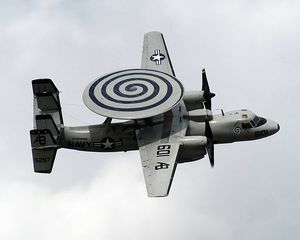 Several countries, such as Australia and Turkey, are deploying "Wedgetail AWACS" on Boeing 737 airframes. These do not have the "flying saucer" rotating radar domes of the E-3, but more modern phased array radars do not need a moving radar antenna. While the E-3 electronics are constantly upgraded, the aircraft itself uses an elderly Boeing 707 airframe, wbich is reaching the end of its service life. For Japan, the AWACS electronics were successfully ported to a Boeing 767. Yet another intermediate option is to use a fixed-wing business jet, such as the Gulfstream, with varying levels of electronics. The Israeli Phalcon, originally on a 707 but moving to executive jets, is considered extremely capable. 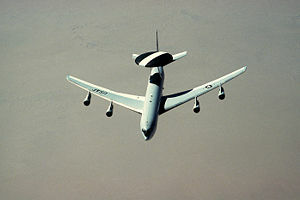 AWACS and AEW aircraft are part of the larger class of C3I-ISR aircraft, which include specialized radar aircraft for ground surveillance (e.g., E-8 Joint STARS, Airborne Reconnaissance Low).